That's a slight uptick from a year ago, when a CNN poll found that 53 percent said they were dreading having to carry on such a conversation, with 43 percent saying they looked forward to such a dialogue. "There's a sense of dread. 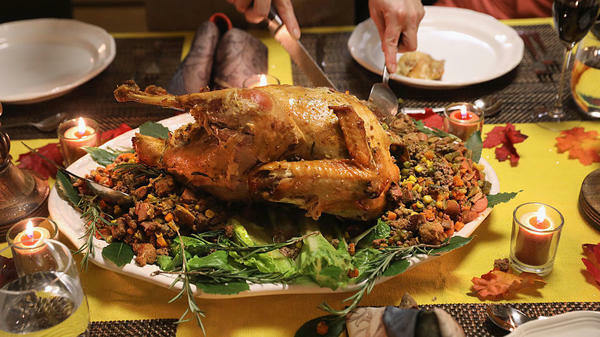 It suggests some indigestion may be part of Thanksgiving dinner if politics come up," said Lee Miringoff, director of the Marist Institute for Public Opinion. "People you work with and go out with socially tend to share political views, but when you get to family, if politics is in the recipe, it may not taste very well." In the Marist survey this month, 43 percent of people said they find it "interesting and informative" to engage with people who have different views of Trump. Not surprisingly, it's Democrats who are less likely to want to engage with people who have different views of the president. About two-thirds of Democrats said it's stressful and frustrating to do so, while a majority of Republicans said it was "interesting and informative." A slight plurality — 47 percent — of independents also thought engaging with differing viewpoints was positive, while 44 percent found it to be a negative thing. Democrats, again, think the tone in D.C. has gotten worse by a higher margin — 79 percent think so with just 13 percent saying it has stayed the same and 5 percent saying it has improved. Sixty percent of Republicans agree the level of civility has dropped, while 31 percent said it has stayed the same, and 7 percent say it has gotten better. Just over two-thirds of independents said it has gotten worse, about a quarter said it has stayed the same and 7 percent said it has gotten worse. Americans are more optimistic about the level of discourse in their communities, however. Just over half of those surveyed said the tone and civility had stayed the same locally since Trump was elected, while 32 percent said it had gotten worse. Only 12 percent said it had gotten better. And once again, it is Democrats taking the most dour view — 47 percent said things have stayed the same; 46 percent said they think it has gotten worse; and only 4 percent said the tone of discourse in their own communities has gotten better. Compare that with 58 percent of Republicans and 47 percent of independents, who thought things locally have gotten better. Twenty-seven percent of GOP voters said the discourse in their community has improved, while just 9 percent of independents thought so. Meanwhile, 30 percent of independents said things have gotten worse locally, and only 12 percent of Republicans thought so. Overall, half of Americans still said they think the political discourse in the country is negative, while 36 percent classified it as angry. Only 11 percent said they think the current national conversation is positive. Republicans are the most upbeat — 21 percent said they think the discourse is positive, but just over half still think it is negative, and about a quarter say it is angry. Democrats were almost evenly split between thinking it is negative (45 percent) and angry (44 percent) with only 9 percent saying it is positive. Americans across the board said they think both parties have crossed a line in attacking the other side — two-thirds thought Democrats had done so. Just 29 percent thought the party had stayed within acceptable bounds. The numbers are almost identical for the GOP — with 67 percent saying Republicans crossed a line in attacking Democrats, and just 27 percent said it has been within acceptable boundaries. Trump's approval rating remains stagnant and steady at 39 percent. A majority (55 percent) continue to disapprove of the job the president is doing. In Marist's past 11 surveys testing the president's approval, he hasn't risen above 39 percent, where it has been five times, and hasn't dipped below 35 percent. "There's not the typical pattern of a honeymoon," Miringoff said. "This is just steady. It's his base that approves, and that's it." Those numbers could bode well for Democratic hopes in the 2018 midterms, but this poll also shows their advantage on who Americans would rather control Congress narrowing to just 3 points, 43 percent to 40 percent. That's a 12-point shift from just a week earlier, when Marist showed Democrats with a 15-point advantage. It is also a deviation from other recent polls that have given Democrats the wider gap they have needed historically to take back control of the House of Representatives. Miringoff explained that the shift isn't due to Republicans picking up voters, but to independents going from Democrats to undecided — for now. On the issues, though, almost three-quarters of Americans said they disapprove of how Republicans have handled health care legislation. Some 60 percent want the Affordable Care Act changed to do more (41 percent) or want to let it stand (19 percent), while just 35 percent want it repealed completely (28 percent) or to do less (7 percent). How Republicans are performing on the tax overhaul isn't much better in the public's eyes, either. Fifty-seven percent said they don't like how the GOP has handled the possible overhaul, with only 31 percent approving. Additionally, one of Republicans' most-used arguments isn't resonating widely either — when asked if they'd be in favor of receiving a tax cut if it meant increasing the national deficit, two-thirds of Americans said no. The poll also found that just over one-third of women said they have been sexually harassed in their workplace. Overall, 1 in 5 Americans, including men, says he or she has experienced sexual harassment. Older women are more likely to say they have experienced sexual harassment — 32 percent above the age of 45 said they have been victimized during their careers, compared with 18 percent under 45. The numbers come as many high-profile men, from Hollywood moguls like Harvey Weinstein to politicians like Sen. Al Franken, D-Minn., and Alabama GOP Senate nominee Roy Moore, have been accused of sexual misconduct or worse. NPR's former top news executive Michael Oreskes was forced to resign after multiple sexual harassment allegations were leveled against him. NPR CEO Jarl Mohn has taken a medical leave amid the fallout from Oreskes' departure. NPR has also placed David Sweeney, who was recently promoted to the position of chief news editor, on paid administrative leave while reviewing allegations about his conduct as well. More allegations surfaced on Monday, against New York Times reporter Glenn Thrush and Charlie Rose, who appears on CBS, PBS and Bloomberg. Even as the list of the accused grows almost daily, a strong majority of Americans (88 percent) said they do believe their workplace takes reports of sexual harassment and abuse seriously, including 69 percent who said they are taken "very seriously." Only 9 percent said they believe such allegations aren't taken very seriously, and 4 percent said they aren't taken seriously at all. Almost two-thirds (64 percent) of employees also said they think the accuser is more likely to be believed by their place of business than the accused in such situations. Just 18 percent said the accused is more likely to be believed.